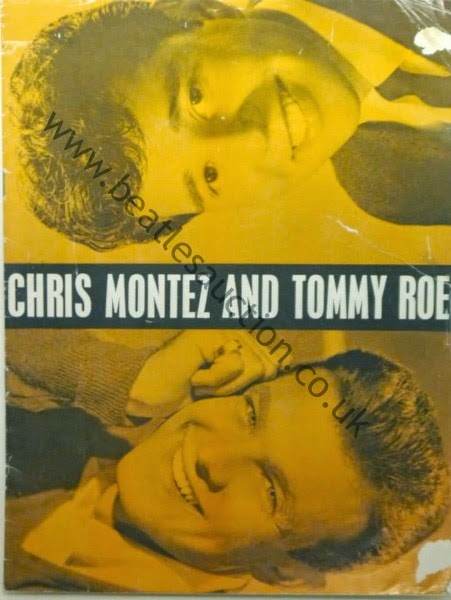 Chris Montez and Tommy Roe Handbill and Programme. This year as the climax to the Beatle Week celebrations Cavern City Tours are presenting Chris Montez and Tommy Roe in a recreation of the legendary tour from 1963 featuring The Beatles. We have some original items from that very tour up for sale in our Annual Liverpool Beatles Memorabilia Auction which is held just a few days before the recreation of the show in the Cavern Club. 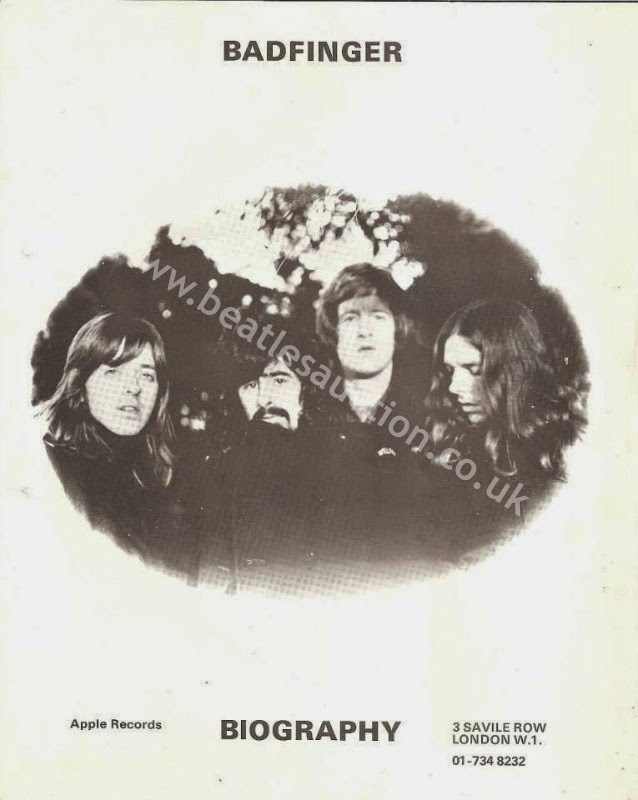 This programme for the concert tour is expected to reach £80-£100 at auction. 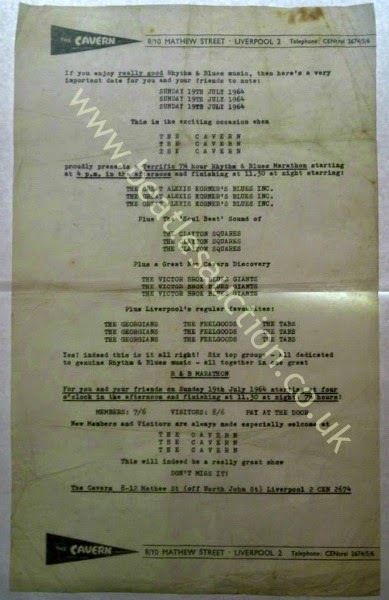 And this rare handbill for the show at the Liverpool Empire Theatre is estimated at £400-£450. 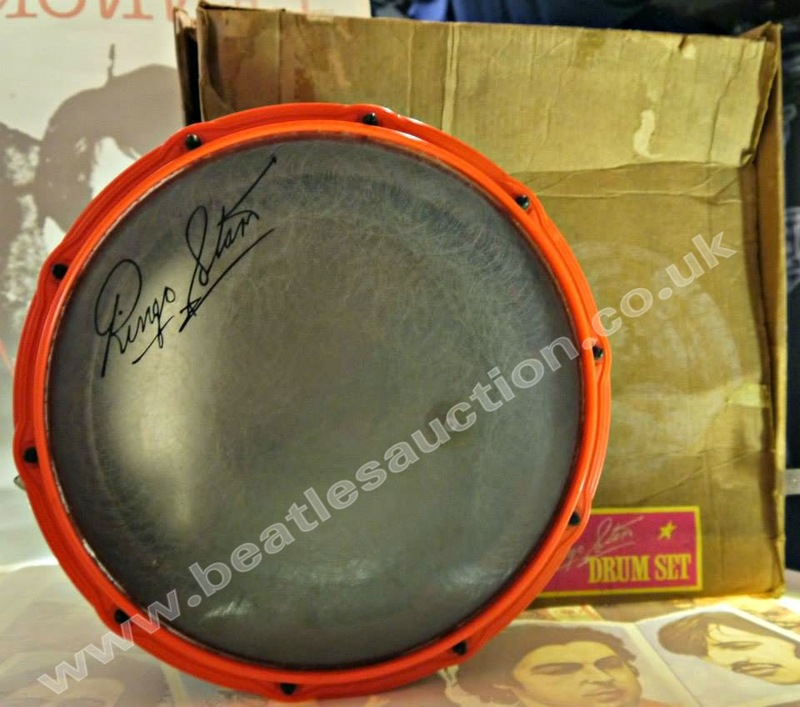 The 2014 Liverpool Beatles Memorabilia Auction takes place on 23rd August 2014 at the Paul McCartney Auditorium at The Liverpool Institute for the Performing Arts. Items are being taken in for this year's event at The Beatles Shop on Mathew Street. Please check the contact page for details of how to get in touch with us regarding valuations of any items you may have and the availability of our valuer. All valuations are free. 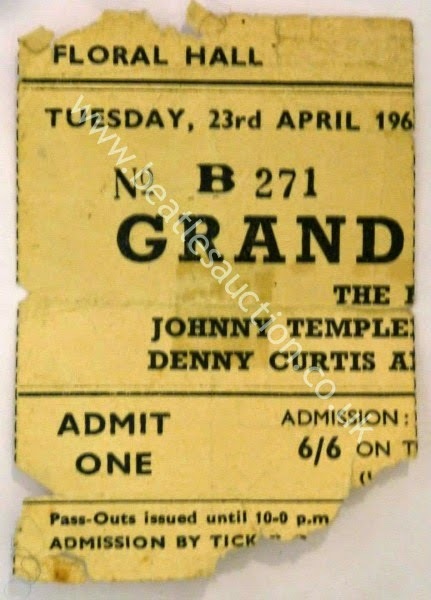 Tickets for Beatles at The Floral Hall in Southport 1963. These tickets are for two separate Beatles concerts at the Floral Hall in Southport in 1963. One dates from 23rd April and the other is from 15th October. This was the last time the band at the venue. The tickets will be sold in our Annual Liverpool Beatles Memorabilia Auction next month. Handbill for the Cavern Club Rhythm and Blues Marathon on Sunday 19th July 1964. 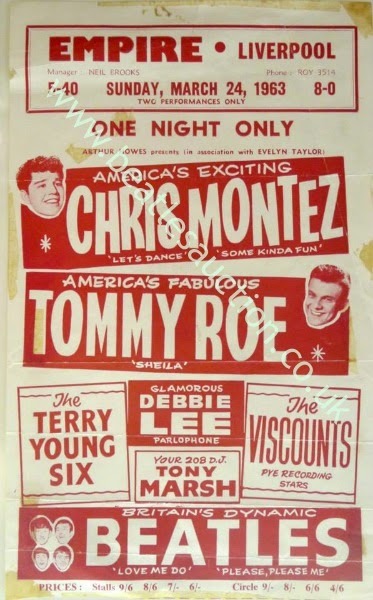 The Tower Ballroom in New Brighton played host to lots of music legends. 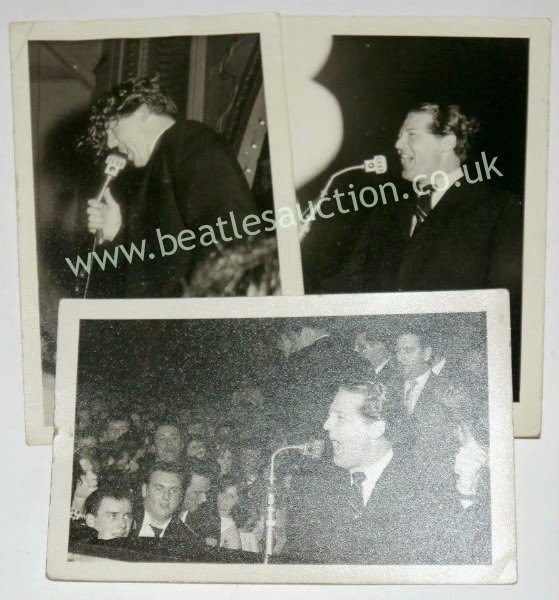 Up for sale in our Annual Liverpool Beatles Memorabilia Auction are these vintage photographs by Robert Dean of rock and roll legends Little Richard and Jerry Lee Lewis at the venue. The annual Liverpool Beatles Auction takes place next month on 23rd August at the Liverpool Institute of Performing Arts. Here's a couple of items in the sale. 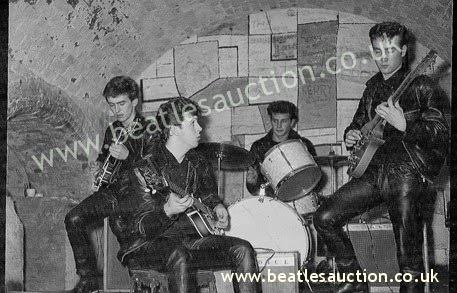 Rare Beatles in the Cavern Images With Copyright. We have two rare negatives of the Beatles in the Cavern Club up for sale in our Annual Liverpool Beatles Memorabilia auction in August. Details of the event are at the end of this post. Both of the images are sold with copyright and one is unpublished. The image below is cropped and watermarked for copyright reasons. The other, unpublished, image is available to potential bidders in a watermarked version on request (click here for contact details). Both images will be available to see on the auction viewing day the day before the event. The estimate for these images plus copyright is £1400-£1600 each. Signed Paul McCartney - aged 11. 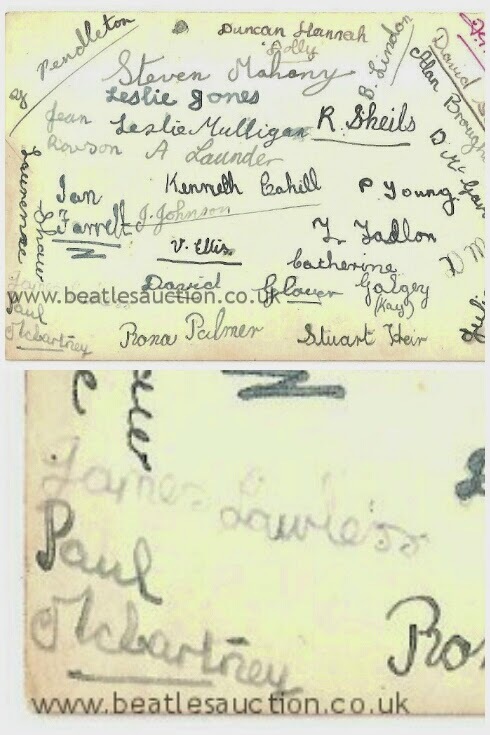 Regular readers of the Beatles Examiner site may have seen a recent report on there about this early example of a McCartney signature. You can read the article by clicking here. 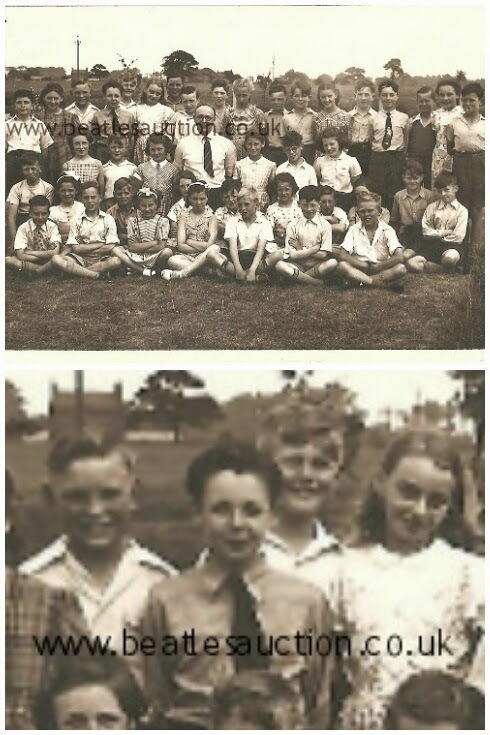 Written on the back of a photo from the Joseph Williams school, Paul's autograph appears with the signatures of all his classmates. He was probably about eleven years old at the time making this one of the earliest McCartney signatures in existence. 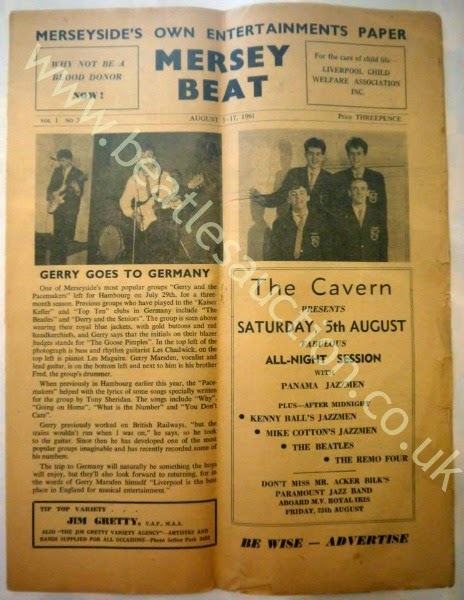 Mersey Beat magazine first appeared in July 1961. The first issue famously featured a piece written by John Lennon entitled "Being A Short Diversion On The Dubious Origins Of The Beatles" which included the line about a man on a flaming pie, from which Paul McCartney got the title of his 1997 album. 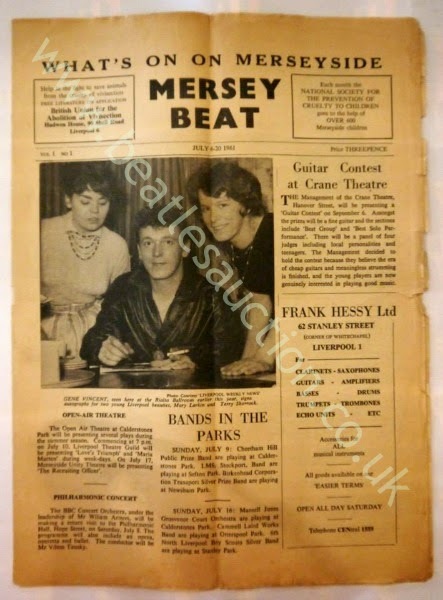 As with a lot of paper memorabilia, Mersey Beats were often discarded after they had been read. Not many people hung on to local papers, music based or otherwise, at the time. Therefore these throwaway items often become highly collectible. 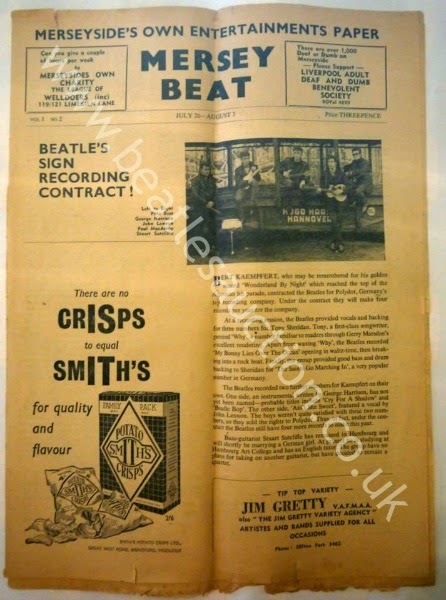 Up for sale in our 2014 Liverpool Beatles Memorabilia Auction are the first three issues of Mersey Beat magazine, including issue 2 which was the first time The Beatles adorned the cover. Each issue is expected to reach £800-£1000. 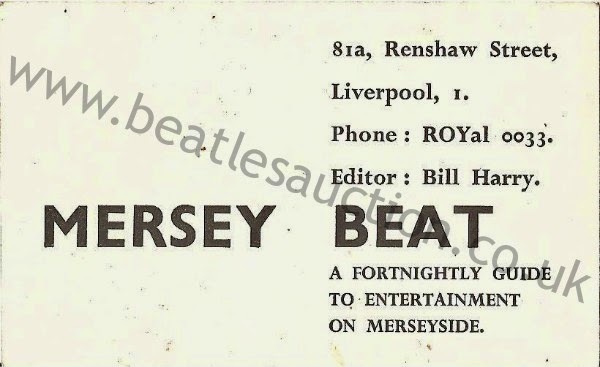 Also in the auction is this Mersey Beat business card. If you get the Liverpool Echo, read it online or have been on our facebook or twitter timelines you may have seen the article about this photograph. If not then click here to read all about it. 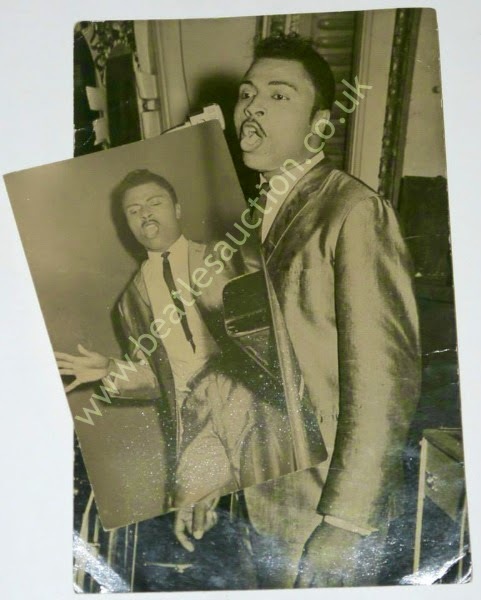 The photograph was taken at St John's Hall in Tuebrook, Liverpool in 1961. The negative for this image, and therefore the copyright, is up for sale along with four other negatives from the same night, in our annual Liverpool Beatles Memorabilia auction in August. The complete lot of five negatives currently carries an estimate of £1750-£2500. 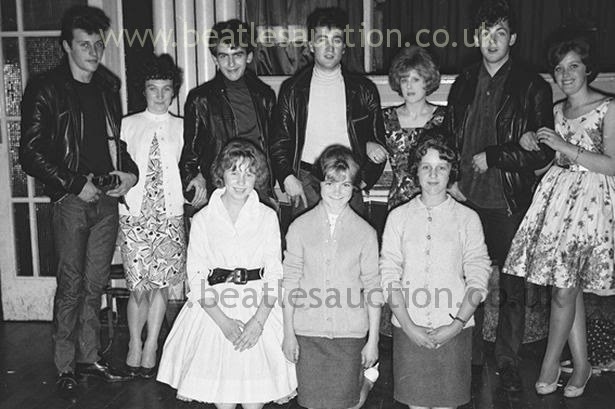 Items from the school years of the Beatles are always very popular in our auctions. 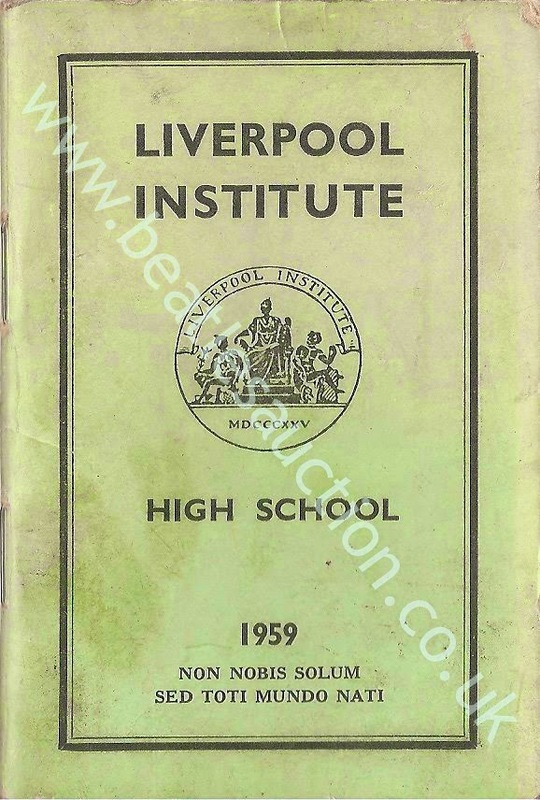 These little Green Books were given out to the pupils of the Liverpool Institute for Boys. 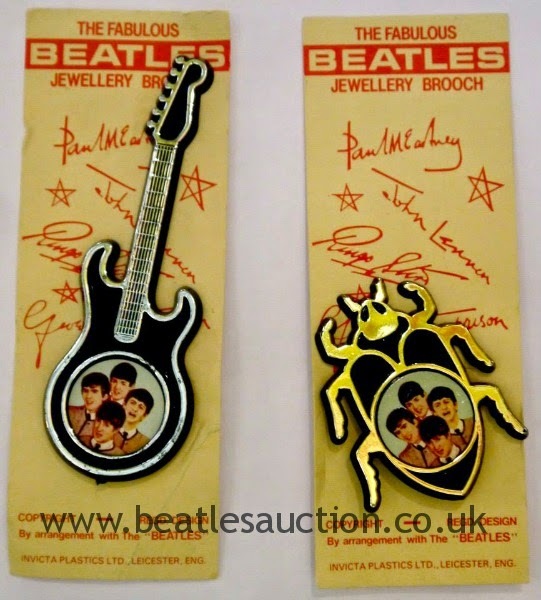 (Which is now LIPA where our Liverpool Beatles Memorabilia auctions are held every year). This particular Green Book dates from 1959 and includes amongst the list of pupils both Paul and Mike McCartney. Another page details Paul's Prize for Art that year. We get some unusual lots in our auctions and just when we think we've seen it all along comes a waxwork dummy of Paul McCartney. Resplendent in his replica Beatles suit and mounted on a small wooden plinth, this life size facsimile comes with a Hofner copy bass guitar. 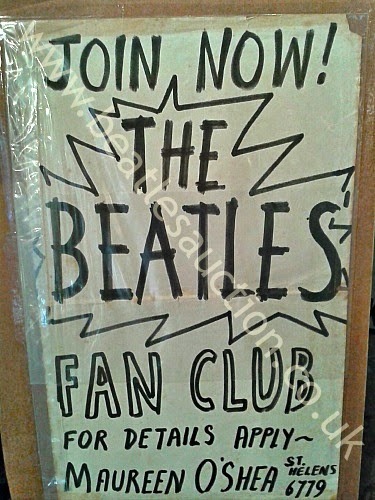 It could be the ideal thing for the Beatles fan who has everything! It will be up for sale in our annual Liverpool Beatles Memorabilia auction in August where we expect it to attract a lot of attention. 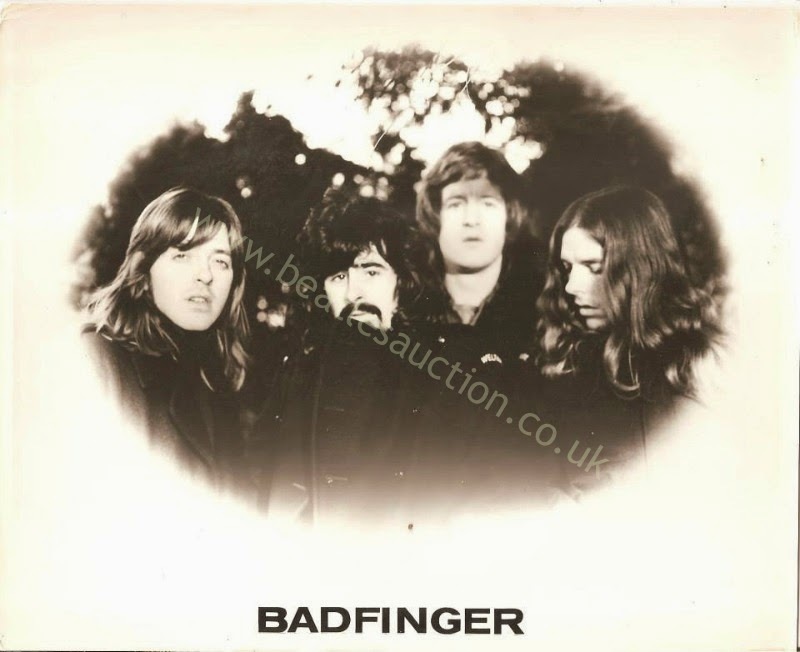 We have two lovely lots of Badfinger items going into our annual Liverpool Beatles Memorabilia auction this coming August. 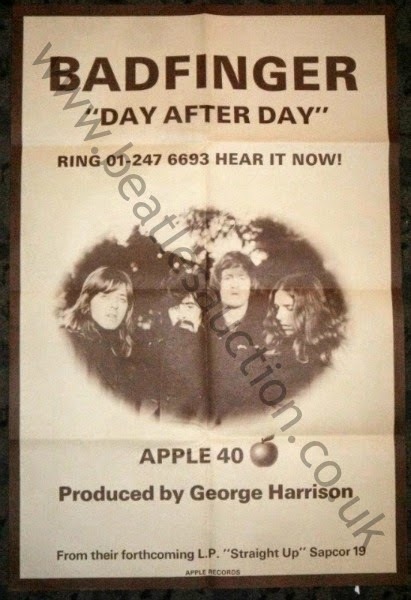 Both relate to the release of the song Day After Day on Apple Records. One lot consists of a press kit for the band which includes a biography, a promotional 8x10 black and white photo and a Fresh From Apple leaflet with details of the release. The estimate for this lot is £120-£150. 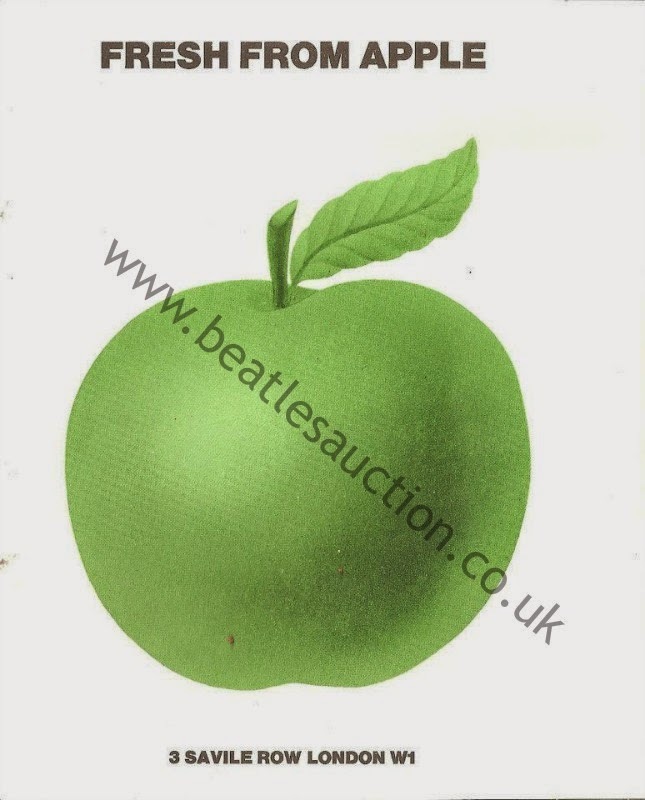 Although we specialise in Beatles stuff for the auction most of the time, we do also get some fabulous stuff related to other bands from the era and area. In our forthcoming 2014 auction we have a small collection of negatives of photographs taken in Birkenhead during the filming of the Gerry and Pacemakers movie Ferry 'Cross The Mersey. These images are sold with copyright. The lot also includes one of the images produced as an 8"x10" photograph and a contact sheet showing all the images for reference. The estimate for this lot is £300-£400. Corgi Yellow Submarine in box. 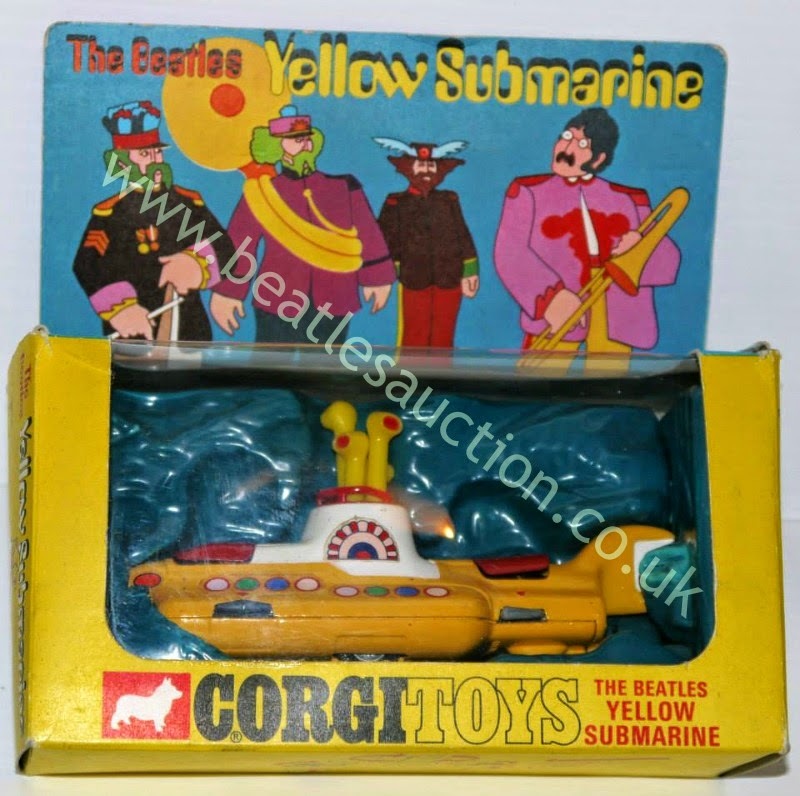 Up for sale in our Annual Liverpool Beatles Memorabilia Auction this coming august - Corgi Yellow Submarine toy in original box. 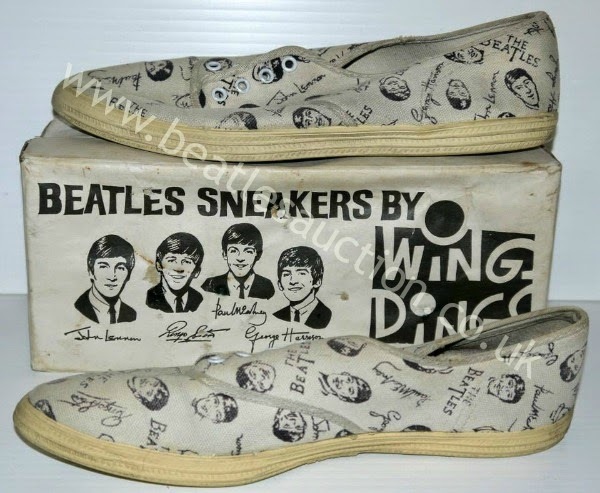 In 1964 the Wing Ding Shoe Company in the USA were licensed by NEMS Enterprises to make Beatles footwear. 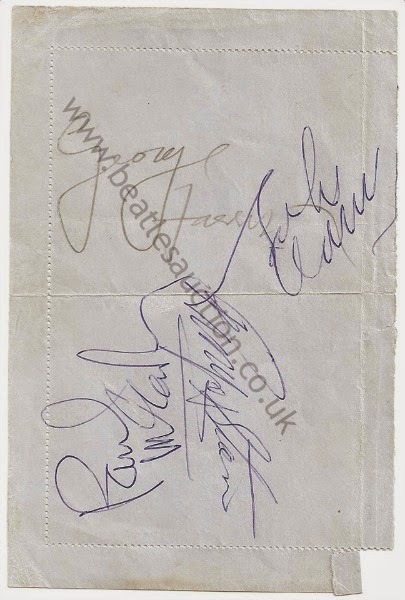 This set of Beatles autographs was obtained for the vendor by a Policeman when the Beatles played in Belfast. 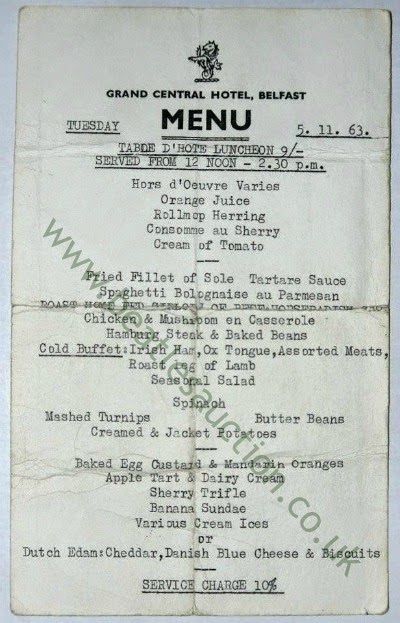 The signatures are on the reverse of a menu from the Grand Central Hotel in Belfast dated the 5th November 1963, the band played in the city a few days later on the 8th. Although there are four signatures only three Beatles have signed the menu, Paul McCartney having signed on behalf of Ringo Starr. 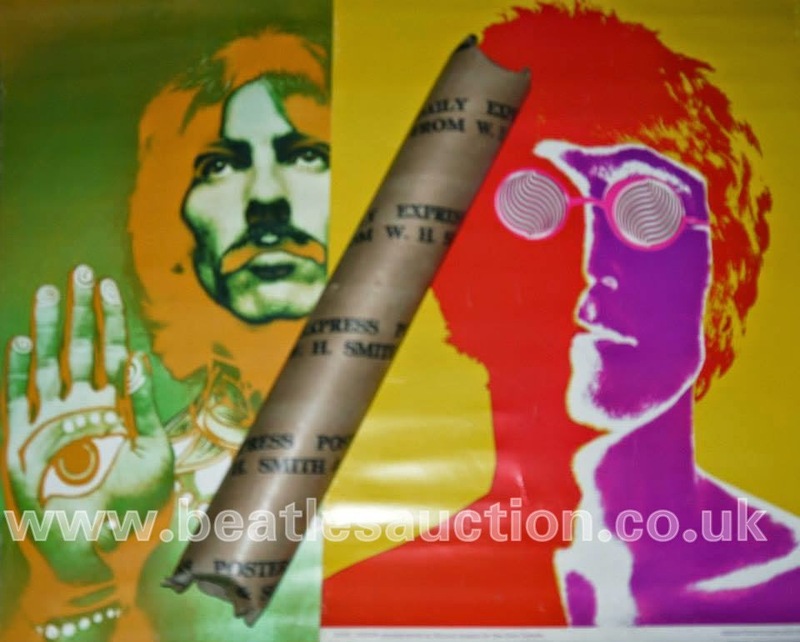 Up for auction at the 2014 Annual Liverpool Beatles Memorabilia Auction in August. The Richard Avedon Daily Express posters are very collectible and look fabulous when framed up and displayed. 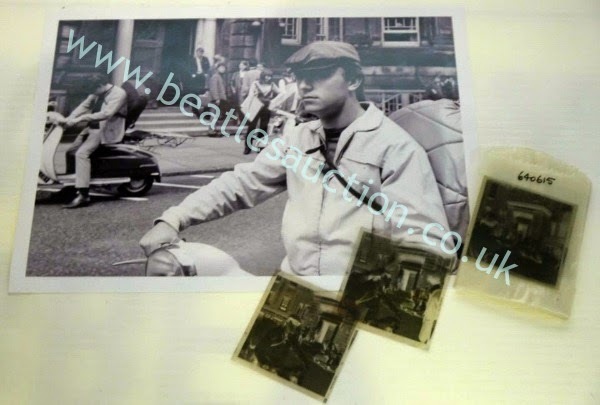 We have a complete set of the four psychedelic images plus the black and white group shot going into our Annual Liverpool Beatles Memorabilia Auction in August. As an added bonus the lot also comes with the very rare original Daily Express WH Smiths mailing tube. This complete set of Dutch drinking glasses date from around 1964. 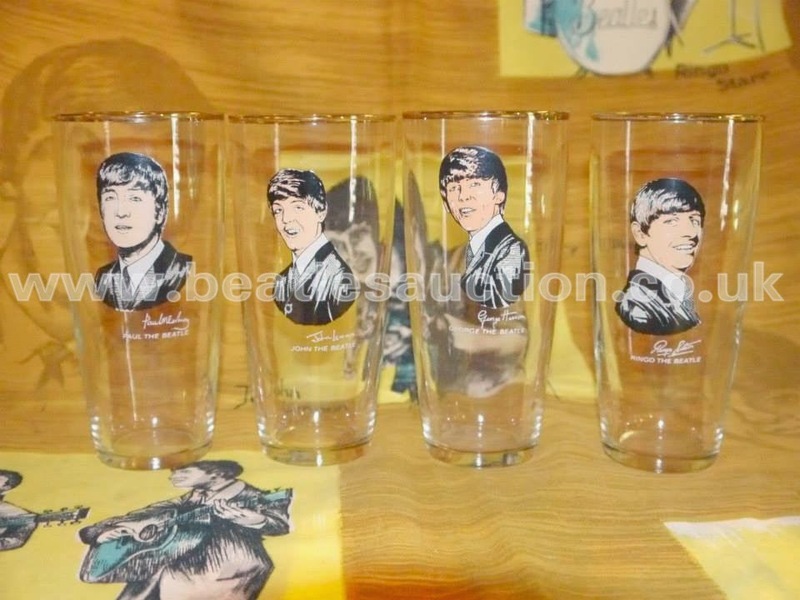 There is one for each Beatle featuring a drawing and their name. Bizarrely the John and Paul designs have the wrong names under their pictures. John's says Paul and vice versa. 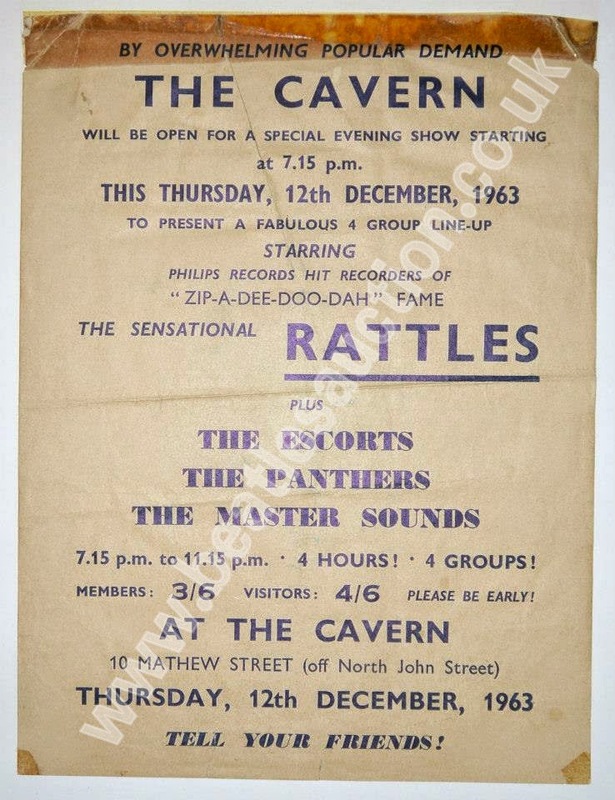 This original Cavern Handbill dates from 1963 and features the German band The Rattles. 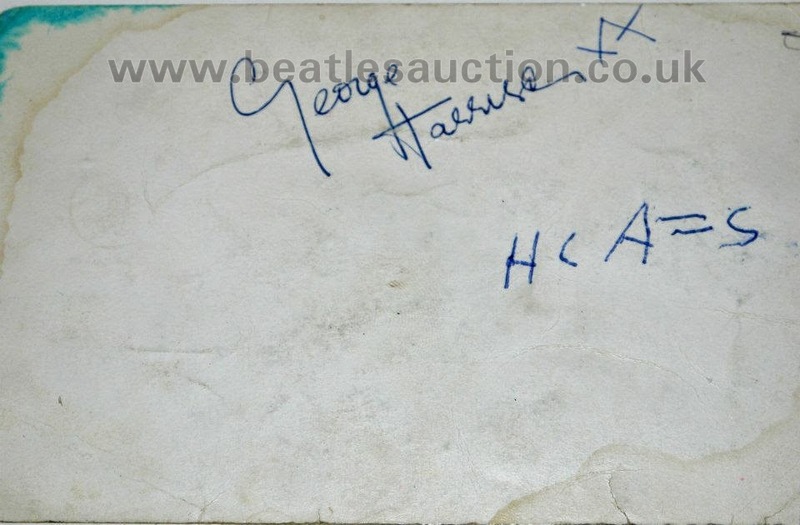 George Harrison autograph on the reverse of a 1960s promo card. Every band needs a drummer even pretend ones, so as well as plastic Beatles guitars Selco made Ringo drums. I don't really know what to write about this item. I don't think we've ever sold anything like this before. Back in the days before the official Beatles Fan Club was formed three girls from St Helens started one up and they would take this notice with them to any gigs to advertise it. 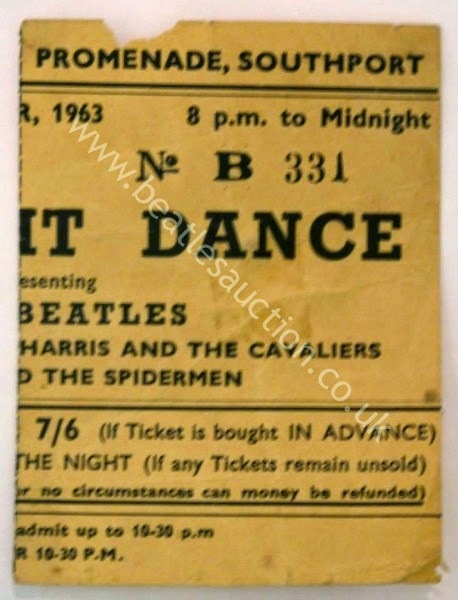 This included trips to the Cavern Club and other local concerts. Details of how the fan club came in to being (including Bob Wooler's part in the tale) and comments from the girls can be found in Mark Lewisohn's book Tune In on pages 489 -491. It's never easy to place a value on something that is so obviously a one-off item, but the current estimate on this notice is £250-£300. It will be sold in our Annual Liverpool Beatles Memorabilia auction in August and will be a great addition to someone's collection. 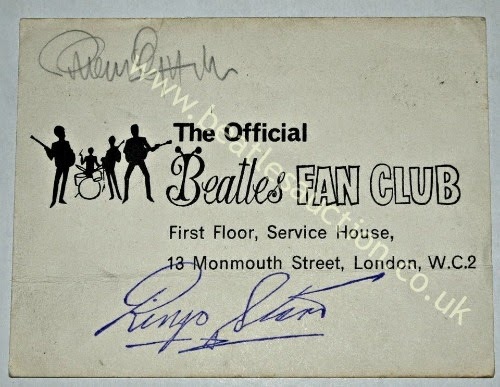 This Beatles promotional card has a printed Ringo Starr autograph on it, which would make it unremarkable. 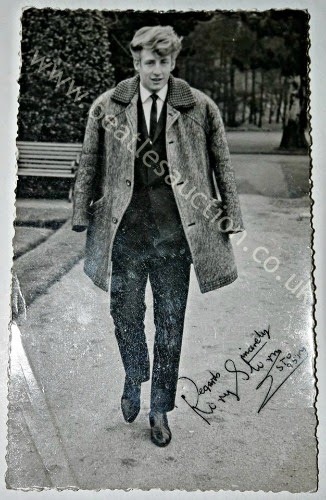 However is also has the signature of the Beatles manager, Brian Epstein, on it in pencil. There's currently lots of interest in Epstein due to the play about to open in the West End and the Dark Horse Comics Graphic Novel. This item carries an estimate of £550-£600. 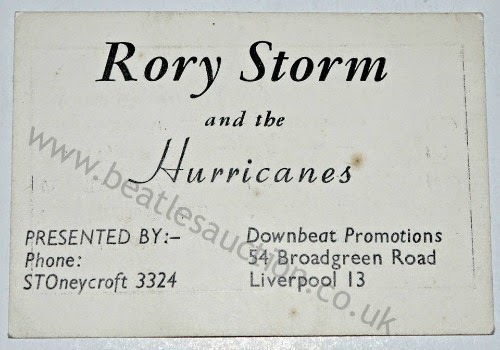 Rory Storm was the master showman of the early Mersey Beat scene. Before he joined the Beatles, Ringo Starr was the drummer for Rory's band, The Hurricanes. 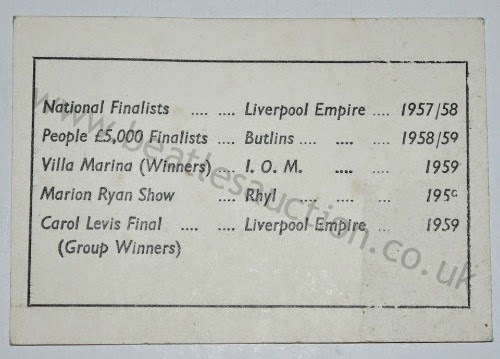 This business card features all of Rory's contact details on one side while the reverse lists various talent shows where they were finalists or winners. 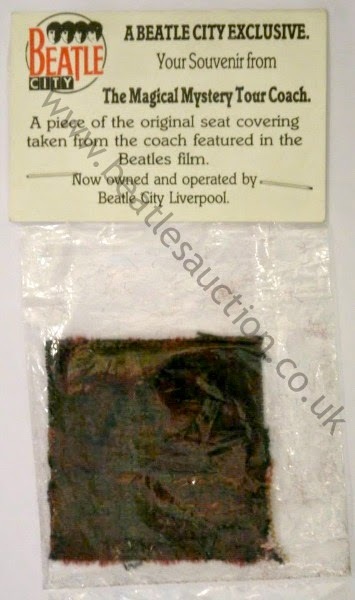 The estimate on this business card is £200-£250 and it will be up for sale in our Liverpool Beatles Auction this August. Also in this year's auction is this promotional photo card of Rory Storm. 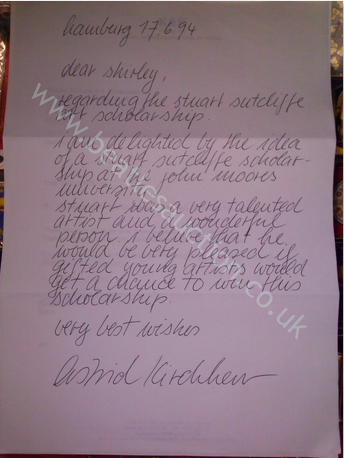 The front features a printed signature and phone number, and it is actually signed on the reverse by Rory and dedicated to Bill. After leaving the Beatles Pete Best continued to play (in fact he's still out there playing) and formed a band called the Pete Best Four. 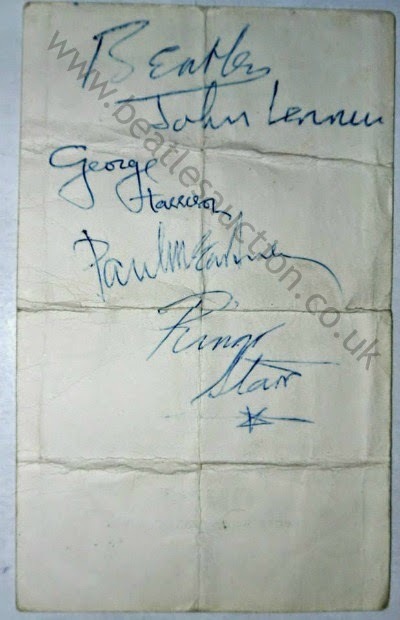 This full set of autographs from the band will be in out 2014 Liverpool Beatles Auction next August. Dating from 1964 this Beatles airbed was made by Lilo. It's yellow with a red back. 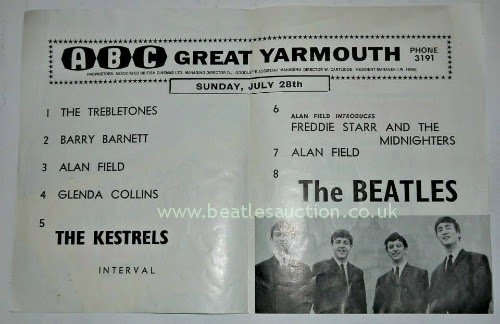 Concert Programme for The Beatles in Great Yarmouth. 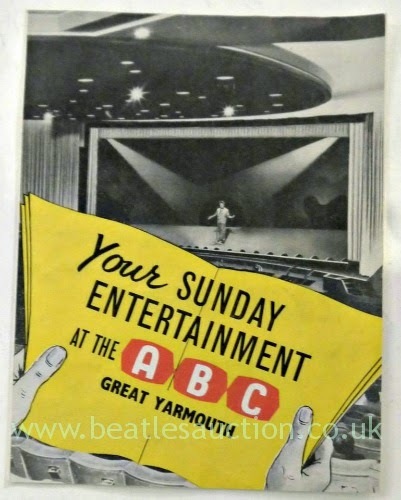 This concert programme is for The Beatles' appearance at the ABC in Great Yarmouth on Sunday July 28th 1963. The estimate for this item is £150-£180. It will be sold in our auction in August this year. 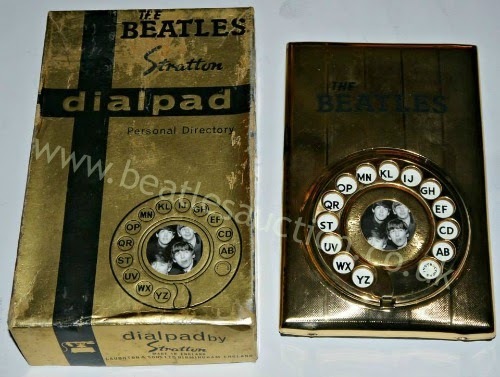 Unusual Beatles Stratton DialPad Phone Book. It was made by Stratton and comes complete with the original box. We estimate that this could fetch £450-£550 when it goes up for sale in our auction in August.